How do you respond to President Barack Obama’s statement that failure to pass more gun control is the “most disappointing” aspect of his presidency? Gun control is a theory that appeases those who think words on paper will affect criminal intent to do violence. In truth, it robs Americans who wish to take responsibility for their personal protection and freedom of the right to do so. It’s a form of oppression cloaked in words like “reasonable” and “sensible.” It doesn’t attack the root of the problem, but exacerbates it. MKS Supply, LLC, Dayton OH, August 2015– Inland Manufacturing and MKS Supply, LLC, the exclusive marketer for Inland firearms is extremely proud to announce its awarding firearms to two shooters (one, the National Champion) at the National Championships held in July at Camp Perry, Ohio. Inland Manufacturing’s President, Ron Norton presented Army Staff Sargent Lawrence Cleveland of the U.S. Army marksmanship Unit (AMU) with a replica World War II 1911A1 pistol ($749.00 MSRP) for firing a blistering score of 294-7X out of 300 possible points and winning the prestigious 2015 National Trophy Individual (NTI) Pistol Match. The NTI Pistol Match began in 1904, the second year of the National Matches, and is considered to be the most prestigious pistol event at the Camp Perry National Championships. 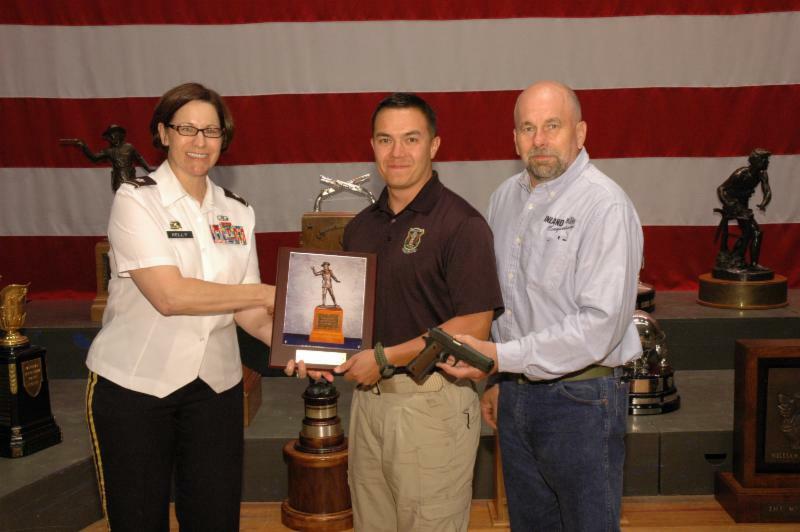 USA BG Maria Kelly presents General Custer Trophy plaque to SSG Lawrence Cleveland (name will be engraved on the National Trophy) and Ron Norton of Inland Manufacturing presents SSG. Cleveland an Inland replica of famed WWII 1911 .45ACP pistol. Inland Manufacturing also conducted a drawing for all the competitors entered in the .30 caliber M1 CMP (Civilian Marksmanship Program) Carbine Match at Camp Perry. Raymond Vaughn of Gwynn Oak, MD won the drawing and received a Model 1945 M1 Inland Manufacturing .30 caliber carbine ($1049.00 MSRP). Here is where karma really comes in play; Vaughn was competing at the Carbine Match with a genuine original WWII Inland manufactured .30 caliber carbine! You are currently browsing the archives for the Matches and Competitions category.